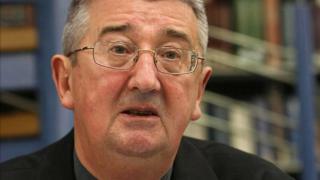 Dublin's archbishop has said he will stop sending trainee priests to the Republic of Ireland's main Catholic college after allegations emerged of a gay culture at the seminary. St Patrick's College in Maynooth is not the right place for men to study to become priests, Diarmuid Martin said. He is "unhappy about an atmosphere that was growing" in the seminary. He added that he would prefer to send priests from his Dublin diocese to Italy to study at Rome's Irish College. Allegations have been made on anonymously, on blogs and in letters, of sexual activity, the use of the gay dating app Grindr and other misconduct at the County Kildare college. Claims were also made that authorities at the seminary were dismissing anyone who tried to make an allegation. Speaking to the Irish national broadcaster RTÉ, Dr Martin said the "culture of anonymous letters" was "poisonous". "Until that is cleared up I would be happier sending my students elsewhere," he said. Dr Martin said he had offered to provide an independent person for whistleblowers to approach with their concerns. "The answer to that was simply more anonymous letters - that's not a healthy culture," he added. "The authorities at Maynooth have to find ways in which people will come forward with solid, hard evidence which can be used to follow up allegations." Monsignor Hugh Connolly, the president of St Patrick's College, told RTÉ there was a "wholesome and healthy" atmosphere at the institution. But he acknowledged that anonymous correspondence had been "difficult". He said: "A seminarian needs to know he is preparing for a lifetime of celibacy - that's non-negotiable." He said that while there had been anonymous letters and blogs, there was no "concrete detail" and the college had not received any complaints about sexual misconduct. He added that the college had an independent panel to investigate any complaints which were made. Dr Martin said he felt Maynooth was not the ideal environment for his students. "Maynooth is a seminary that was built for 500 students - it now has 60 [to] 70," he said. "I think a lot more structural reform will be needed at Maynooth. "We probably need a different way in the long-term. "I would prefer to have my seminarians living in the reality of Dublin life. "The formation, I believe, would be better outside the closed, strange world of seminaries."